The artists pose with Canadian Ambassador to China John McCallum (third from right). A panda and a beaver join together as the two central images on the wall of a tennis court at the Canadian embassy in Beijing, created on Oct 20 by a group of four graffiti artists from Wuhan, Hubei province, with a Canadian counterpart who's based in Beijing. The graffiti is to celebrate the 2018 China-Canada Year of Tourism, as well as the cultural diversity of the two countries. Canadian Ambassador to China, John McCallum, says: "The fantastic picture features the two symbolic animals from our two countries, showing them coming together." He says he hopes there will be a much bigger coming together soon by way of a greater exchange of tourists between the two countries. The Bloodbro graffiti group started the project soon after arriving from Wuhan, with a draft prepared beforehand. They finished the mural on the 13-meter long and 2-meter high wall in about six hours. Their fluent English made it easier to communicate with Steve Northcott, the Beijing-based Canadian graffiti artist. "We don't often create a draft, but this time, we did," says Jian Jie, one of the group members. "We're glad that we could leave our mural with Chinese features here at the embassy." The Canadian cultural counselor, Martin Laflamme, and his colleague, Liu Zengyue, planned the project. They found the Chinese artists on the micro blog Sina Weibo. 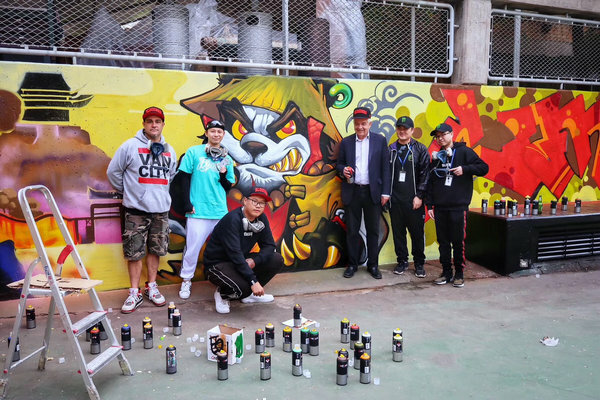 A graffiti work on the wall of a tennis court at the Canadian embassy in Beijing by a group of four artists from Wuhan and a Canadian artist who lives in Beijing. Jian says the team's English competence has enabled it to visit and collaborate with its peers in Thailand, Germany, Norway, Denmark and Canada, and at events such as the Berlin Mural Festival. To Jian and his team, graffiti now is more than the "paint and run" street culture－the style of the art, and perception of it has been expanded and upgraded. When they worked at the embassy, they wore T-shirts and hats with their team logo on, facial masks and protective glasses. "The spray paint is about 20 yuan (.88) per can, and a wall like this usually uses more than 100 cans," another member Fang Zijun says. "Graffiti is getting a little bit expensive now." The team primed the wall with a layer of black paint so that the cement would absorb it and thus form a foundation for the colored paints. "It should last for more than 10 years," Jian says. Fang says he runs his own business, as does one other member of the team, so he can afford the time and money to create graffiti. While Jian and another member named Panda are from art schools, Jian has graduated and works for a Wuhan museum. The team has been together since 2008. "Chinese graffiti artists are as good as their foreign peers. We have been trying to mingle more traditional Chinese elements with the graffiti language, which gets us recognized on the global stage," Jian says. "Our personal favorites are traditional mythical animals, characters from Chinese tales and mythology, the four ancient classical novels, and original Chinese cartoon figures－of course, all with our personal tags," he adds.